14 December 2008 - I love adventure. 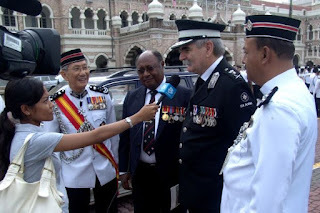 That's why I joined the 100 years celebration of St John Ambulance in Malaysia in Kuala Lumpur on the 14th December 2008. We departed from St John headquarters by bus at approximately 6.45am on 12th December. The journey to the training ground, or known as Pusat Latihan Polis (PULAPOL) took 3 hours. St John members from various states were also participating in this meaningful and historical centennial celebration. Around 40 members and 3 officers from our state were participating. 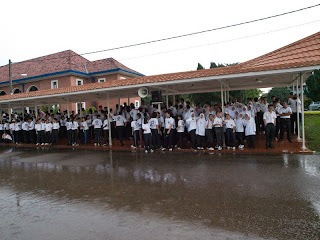 We arrived at PULAPOL around 10.30am. From what I can observe there, the police training center is a place where police trainee are carrying out their training. 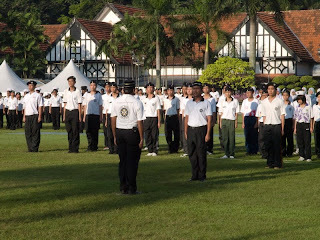 We were not allowed to walk on the huge training center and were forced to march, haiz. 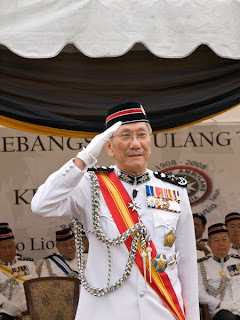 The president of this 100 years celebration event was Mr V.S. Maniam. A brief introduction was given by the strict-looking, middle age man. He emphasized on the discipline and cooperation among the members from different states with the organizing team *yawn*. After lunch, rehearsal was done in the guidance of an ex-army officer, Mr C.S. 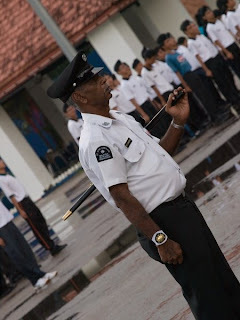 Chandran, Head of Training for SJAM. Well, guess what? Teik Sum 'blackout' during the 3-hour rehearsal *^^*, HEY YOU, stop teasing! Dinner was quite good, unlimited rice and curry chicken up for grabs, apple is a must for every meal *yummy*. After dinner was briefing again from Mr Maniam. He thank us for supporting this celebration and express his delightment for our burning spirit during the rehearsal. We were supposed to spend our night at the hostel at PULAPOL but due to insufficient beds *swt*, we have to walked to Universiti Teknologi Malaysia (UTM), which is located next to the training center, for our accomodation at the hostel. My roommates were Donivald and Kin Ho. Before sleeping, we even play cards with Kar Chun, a from 3 members from SMK Jalan Pasir Puteh *haha* (JPP). Lights out - 12.oo midnight. I'll make it short. Woke up at 5.00am because we must be ready to walk to PULAPOL at 5.30am. Breakfast was splendid, char kuetiaw and hard boiled eggs plus orange juice. Well, actually the orange juices is not for us, we sat on the bench for the police*haha*. 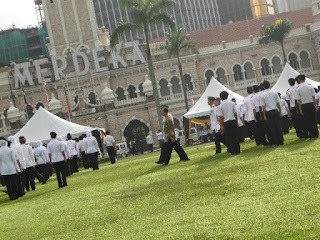 The second rehearsal was quite fun, it was held at Merdeka Square aka Dataran Merdeka. After the rehearsal, we went back to PULAPOL for some rest and lunch. Kinda boring this day, rehearsal after rehearsal. As usual, nothing will make a marching rehearsal perfect without a few soft-nuts dropping down. After dinner was 8.00pm. That means we still have plenty of time before lights out. Sir Leong, our officer in charge, decided to let us enjoy by going to KLCC *yay*! 1 hour shopping and loitering there makes everyone feel better. It's the 14th December! It's the reason why we are here! It's action day! 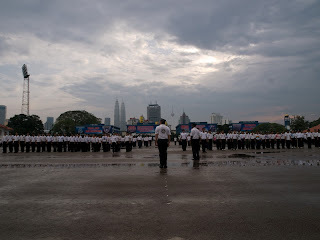 We changed to our uniform after cleaning up and get ready for the journey to Dataran Merdeka once again. 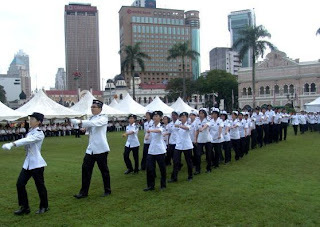 Like what we've done for the rehearsal, we marched towards the parade full of pride and excitement. 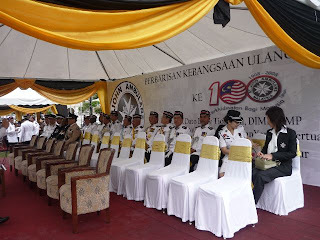 The deputy health minister and a few high ranking officer including Dato' Low Bin Tick, Pemerintah Agung SJAM were invited to witness this meaningful event. The national anthem and St John song were sang. Before that, 26 buses from the International Cadet Camp (ICC) drove in and joined us for tis celebration, Can you imagine that? It's approximately 1000+ members from Malaysia, Singapore, Sri Lanka and a few countries. After the march pass, speech were given by the deputy health minister and Dato' Low Bin Tick. The celebration was officially over at 10.00am *phew*. We changed to our casual and went to Time Square to enjoy after 3 tiring days. 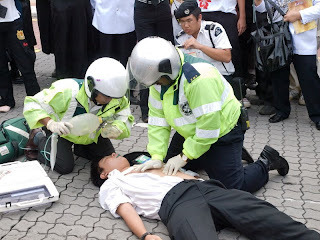 Oh, did I mention that Sir Leong fainted during the celebration? He fell straight backwards and has to be carried out with a stretcher. I like the meals served at PULAPOL! it's unlimited and tasty. Can i have more? I witnessed the different types of uniform and badges from various states. The 4 commanders' voice were amazing. I can't describe it. It's like he's shouting command from Old Town Kopitiam opposite SMI and you can hear it clearly on the basketball court. 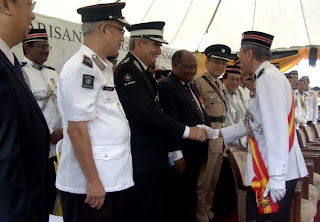 History has been made and this signify the 100 years celebration of St John Ambulance in Malaysia. 5 December 2008 - That's all from me! Went to Ipoh Parade KBox to celebrate Vincent's birthday which falls on 7th December. Guess what? A so call 'chocolate cake' was bought by Soon. That cake was.. ahem, DAB (read it backwards! ).